Bombardier Transportation is showcasing advanced signaling and rolling stock solutions at the Rail-Tech trade exhibition this week in Amersfoort, Netherlands. Visitors are getting the chance to experience first-hand, how the latest rail control and signaling systems work, such as the Interfolo 550 European Rail Traffic Management System (ERTMS) regional solution, the latest EBI Switch point machine and EBI Track train detection systems, and Bombardier’s rail control application for stabling yards. Since the last Rail-Tech trade show two years ago, Bombardier has progressed successfully in the Netherlands market, where it has secured substantial rolling stock and several significant signaling contracts in the Benelux, according to the company. At Rail-Tech, Bombardier will highlight rolling stock products designed to accompany cities in their public transportation development. The Brussels Transport Authority STIB (Société des Transports Intercommunaux de Bruxelles) ordered 220 Flexity trams from Bombardier and now has the largest single vehicle-type tram fleet in the world. Last year, following this success, the Flemish transport operator De Lijn placed the largest order in its history for the supply of 48 Flexity 2 trams with an option for another 40 vehicles. 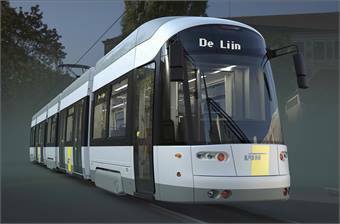 These new trams will provide an efficient tram service for many years for the two largest Flemish cities in Belgium. The Flexity 2 tram, which has been in successful revenue service in Blackpool (UK) since April 2012, is a light rail vehicle platform in the true spirit of Bombardier light rail vehicles. By using a mix of proven technology and further innovations the tram is an ideal fit for the future growth of cities. To reduce costs, Bombardier chose a platform approach while still giving its customers maximum choice when it comes to design and passenger focus. Between 1998 and 2002, Bombardier Transportation delivered 82 metros and trams to the Rotterdam Transport Authority (RET) with a further 64 vehicles to Randstad Rail and RET between 2008 and 2012. Over the years, Bombardier has proven itself to be a long term reliable partner to the Netherlands Railways and has supplied several generations of trains which have received widespread customer satisfaction. The latest generation of Sprinter trains has received good reviews as passengers appreciate the improved accessibility combined with a low floor throughout the whole train.